Feast In The East Collective is made up of core members curator/illustrator Tad Michalak, curator/musician Neil Rankin and curator/producer Katie Jensen. Our mission is to produce a concert series in Toronto’s east end that is able to unite and cross pollinate diverse musical, culinary and artistic communities. We aim to bring together audiences from Toronto’s east and west end neighbourhoods, which are often separated by a mere mental barrier, rather than a small geographic one. We have been producing Feast In The East each month for almost six years. Originally, the concert series was founded by Tad Michalak and Neil Rankin, but as the series has grown, so has our collective. Curatorial roles are shared by all core members. 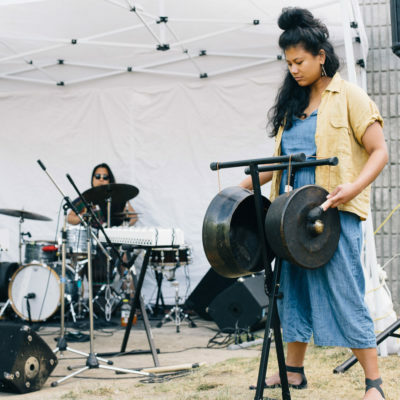 Each edition of Feast In The East includes performances by 3-4 musical acts, installation work by an artist or group of artists, and a complimentary meal prepared by a guest chef.